When talkbox was first released, it was called by various names such as voice box, talking modulator, mouth tube, or a mouth wah. 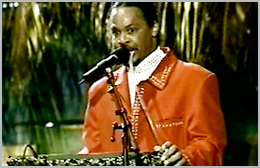 It is said the name “talkbox” was standardized by Roger Troutman of ZAPP, one of the key persons in funk talkbox history. 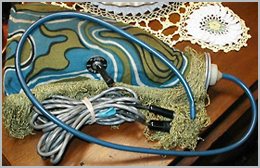 The very first talkbox to go out on market is said to be Kustom Electronics' “The Bag,” released in 1969. Its appearance is just like a water bottle in a bag, but this triggered other manufacturers such as Jim Dunlop and Electro Harmonix to start manufacturing talkboxes. This web site focuses on talkboxers in Funk, R&B, and Hip Hop music. Talkbox sound in Funk, R&B and Hip Hop varies greatly from the effect-like sound of guitar talkboxes, and sounds as if the performer is actually singing. Talkboxers in Funk, R&B and Hip Hop music explored different techniques and performed on synthesizers in place of guitars so it can produce a wide variety of sounds. Stevie Wonder is said to be the first musician who performed the talkbox on the synthesizer. His performance can be viewed on You Tube. Roger Troutman took this to a further level and established his own distinct style. His performance can also be viewed on You Tube. Roger Troutman has made a powerful impact on talkboxers today. Since talkbox creates sound that is somewhat mechanic compared to a human voice, some people may confuse it as a vocoder and Auto-Tune. Vocoder's structure and sound differs completely from a talkbox. In a vocoder, human voice and synthesizer signals are respectively directed through 10 to 20 band-path filters and envelope followers to analyze the human voice and reproduce the modifying amplitude by each bandwidth frequency. Talkbox and Vocoder are similar in a sense that it both filters a synthesizer, but band-path filters are used in a vocoder where the actual mouth is used in a talkbox. Therefore, a more precise pronunciation is possible with a talkbox.